HAVING a holiday with young children can never be hassle-free. Going to the beach and staying at a seaside resort offers many options, but you are hard-pressed when it comes to staying in a hotel. Options are further restricted if you want to stay in the vibrant heart of the city. Well, that's not the case any more - at least, not in Sydney. The Swissotel Sydney, in Market St, is one deluxe five-star hotel that is very family-friendly. Its kids' room will delight those aged two to 12. Children will be transported into a wonderland where the rooms are bright, with an abundance of plush toys, a pint-sized desk, colourful bed linen, special menu of DVD programs for young ones, bath amenities for junior guests, separate play area, and much more. The room is interconnected with a separate luxurious bedroom for the parents. As well, the honeymoon suite at the Swissotel is indulgent - the rooms have spectacular views of the city, the bed is more than comfortable, and the bathroom is spacious. The room has a Nespresso coffee machine and Wii. For more information visit Swissotel. It's very easy to feel on top of the world at the Diamant Hotel in Sydney - in the luxury penthouse - and easy to soak up the urban vibe. Overlooking the city's skyline and Sydney Harbour Bridge, the 12th floor three-bedroom penthouse combines contemporary luxury living with rock-star glamour, located moments from Sydney's most pulsating quarter. For more information visit Diamant. My one-bedroom suite overlooked Rushcutters Bay Park and the Cruising Yacht Club Marina, with the hotel surrounded by Sydney's most exclusive shopping and nightlife. The options are endless: chill out and stay up late in Kings Cross, Double Bay, Paddington, Woollahra and Potts Point, or escape the action and head to the rooftop pool. For more information visit Vibe Hotels. 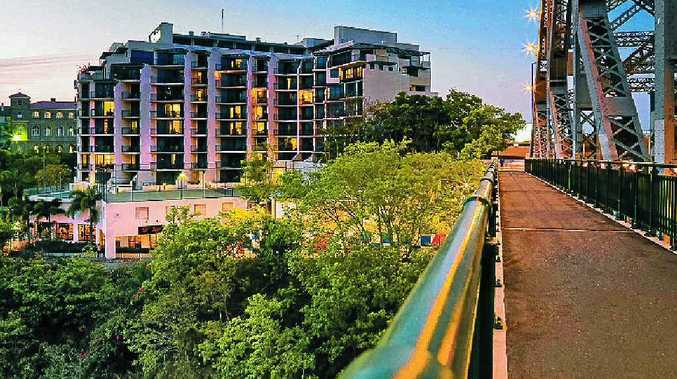 Located at the east end of the city centre, the Medina Executive in Brisbane offers sweeping views of the Brisbane River, the city skyline and the iconic Story Bridge. Our one-bedroom apartment on the eighth floor was the ideal spot to witness the best of Riverfire 2011 in September. We had ringside seats, sitting on the balcony, overlooking the Story Bridge. For more information visit Medina. The chic Lyall Hotel and Spa in South Yarra is Melbourne's only privately owned and operated five-star hotel in a fashionable address that's tucked away from the busy main road. Voted Australia's Leading Boutique Hotel by the World Travel Awards, the hotel has 40 suites of contemporary oriental design. For more information visit The Lyall. Australia's first legal casino, Wrest Point opened in February 1973 in a prime waterfront location on the Derwent River. Its iconic tower has represented accommodation excellence in Hobart for nearly four decades and now the hotel's entertainment precinct has been enhanced. Indulge in a fine dining experience at the award-winning Point Revolving Restaurant, where head chef Kent Sullivan adds his own Tasmanian twist to traditional French-style cooking. For more information visit Wrest Point. Over looking Glebe Park, Crowne Plaza's central location places it within two minutes' walk from Canberra's National Convention Centre and near the city's many shops, lively bars and restaurants. Parliament House is 3km away. Explore artistic treasures at Australia's National Gallery and National Portrait Gallery, take a walking route around the shimmering waters of Lake Burley Griffin, hear the chime of the National Carillon and view the Captain Cook Memorial Fountain for lasting memories of Canberra. For more information visit Crowne Plaza.